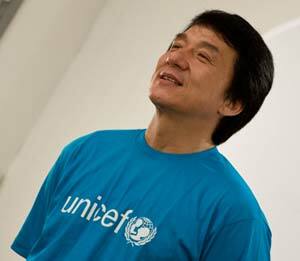 Continuing his peace mission in Cambodia, Jackie spoke at several schools on November 11,2009. After talking with students at the International School of Phnom Penh, Jackie gave a speech at the University of Cambodia and was awarded an honorary doctorate degree. Jackie is in Cambodia for the Bridges: Dialogues Towards a Culture of Peace event sponsored by the International Peace Foundation. When the kids opened the presents their eyes lit up and they kept thanking me and telling me how much they loved me. I felt so awful! I felt like such a fake because I didn’t know anything about the presents and the kids thought I’d given them personally. From that day on I vowed never to repeat that kind of behaviour. After that I always pick out the presents myself and make sure that I take care of those less fortunate, especially children. When I was a young boy in the China Drama Academy (Peking Opera School), I didn't think much about fame and fortune. It was a struggle just to get through each day; to find enough to eat, to avoid being beaten by my masters, just to survive. That sounds dramatic, but it's all true! As I got older and began working in films as a stunt man, my dreams began to focus on being famous and making lots of money. When I started to become famous, I was quite arrogant and thought only about myself and buying lots of watches and cars. I didn't think much about charity. Later, after the accident in Yugoslavia, I changed my thinking and realised that I should be thinking of others, not just about me. It was a natural progression to become a humanitarian and I’m very proud of the work I've done for charity. I am happy that my fame allows me to bring attention to the problems in the world. How do you find the energy to fulfil your multiple roles in life? I am naturally a very energetic person, so I don't have a problem finding the energy to do all the things I do. I rest whenever there is an opportunity and then when I'm needed, I wake up and am ready to go. Martial arts teaches discipline and self-control. It's also a very good form of exercise, and exercise is good for the body and for the mind. I don't think about martial arts in terms of preparing for war. For me it's just a way of life. Of course I was shocked by the numbers of men, women and children who had been maimed by the landmines buried in the fields near their homes. But I was most impressed by how warm and friendly the people were, and that they could have such a positive attitude despite their terrible injuries. Is there any chance of you making a full-length feature film in Cambodia? When I visited Cambodia five years ago with Unicef, I thought that there must be a thousand stories there that would make a good movie. Right now my schedule is filled for the next few years, but someday I'd like to make a movie in Cambodia. I know that young people don't like to have old people give them advice, but if I had to tell them something, I'd tell them to respect their parents, avoid trouble with the law and try to think about others. It's not important to have all the latest gadgets and expensive clothes; it's important to be a good person and take care of each other. I would tell them to exercise and eat right and that if they do this they will feel content. And when you feel good, it's easy to deal with all the problems in your life.